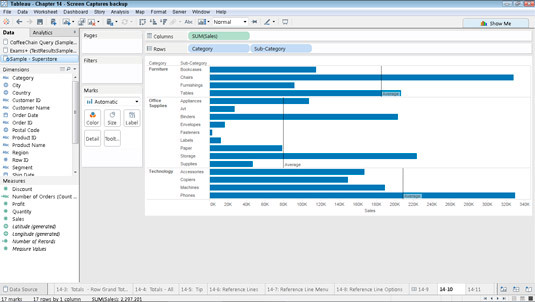 One way to enhance your Tableau visualizations is by adding a reference line, band, distribution, or box plot to the chart. This feature is useful for indicating things such as average sales, product sales goals, and so on. For example, you could use a reference line to indicate the minimum sales target so that it will be easy to see which stores have achieved their goal and which stores have fallen short. 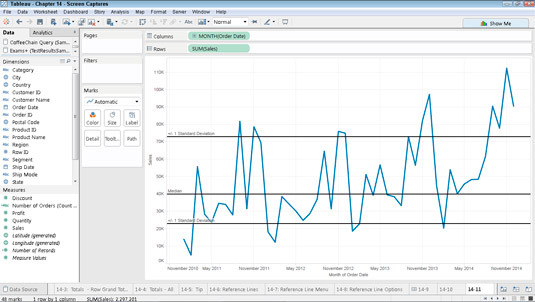 Tableau gives you considerable latitude in adding reference lines, bands, distributions, or box plots. Reference lines are straight lines that originate from a constant or computed value on an axis. To add a reference line, click on the Analytics tab and choose add reference. Add Reference Line from the pop-up menu that appears. Begin by choosing Add Reference Line from the contextual menu. Check out the options that appear in the dialog box for reference lines. 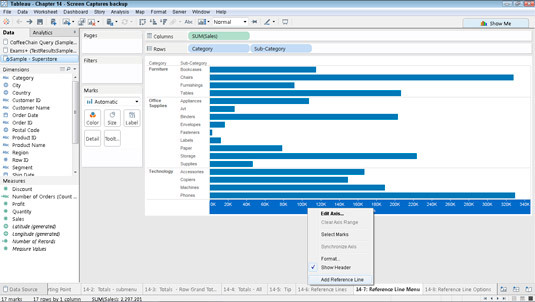 First, using the options under the Scope heading, choose whether you want the reference line to be the same across the entire view or whether you want it to be different for each pane or each cell in the chart. The Per Cell option is often used to compare an actual value to a target value, while Entire Table and Per Pane might be used to compare bars to an average. Understanding the Entire Table, Per Pane, and Per Cell options. 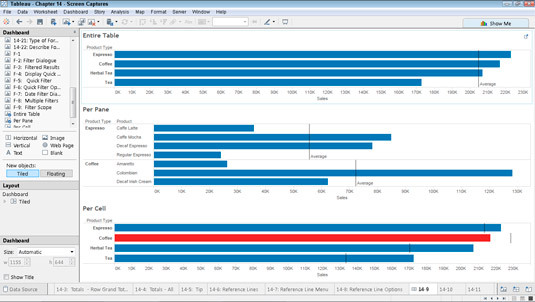 Reference lines will recalculate and dynamically change based on selections you make in the view. Simply click on a few marks and, while the original reference line stays intact, it fades, and an updated reference line will appear until you clear or change your selections. Next, you need to specify the line settings by choosing the measure or value that will be the basis for your reference line. You can also select the appropriate aggregation or value as Average, Constant, Maximum, Median, Minimum, Sum, or Total. For example, if you wanted your reference line to appear at a specific number representing a sales goal, you would choose Constant and then specify the value or choose a field from your data set that contains those target values. You can then choose how to label and format the line. There are several choices for labels, but notice that the default is set as Computation (such as Average, Maximum, and so on). 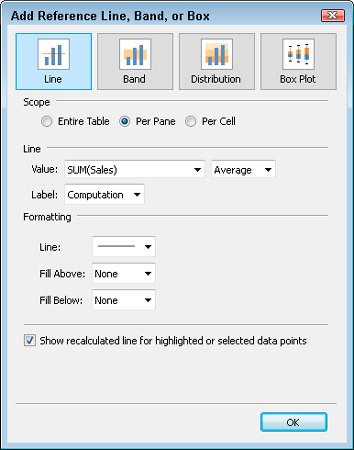 In this case, choose to show a reference line for Average Sum(Sales) for each pane. Choosing Average Sum(Sales) for each pane. Distributions are similar to reference bands, except with options for gradient shading to indicate the distribution of values along an axis. Here’s an example of a reference distribution that shows monthly sales over time as well as how those values are distributed. An example of a reference distribution. For distributions, you can choose Confidence Interval, Percentages, Percentiles, Quantiles, or Standard Deviation. In addition, you can choose the formatting for the gradient. Box plots, also known as box-and-whisker plots, are a visually concise way of seeing and contrasting distributions of data. The boxes show the middle 50% of the data (or in other words, the middle two quartiles of data). Whiskers are added to box plots to show further information about the distribution of the data. 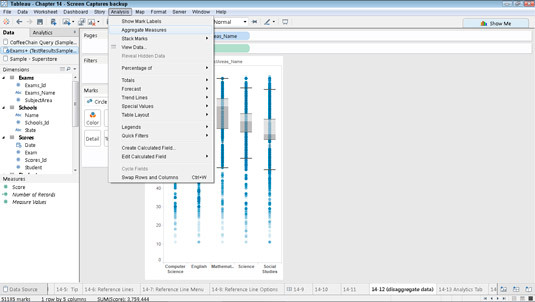 In Tableau Desktop, whiskers can be configured to show either the full extent of the data or 1.5 times the interquartile range (the length of the box). Use the latter to help identify potential outliers. Normally when creating a box plot you are showing the distribution of values across different dimensions. Thus, you will want to be sure to disaggregate the data with one of two options. You can add one or more dimensions to Detail on the Marks card or you can uncheck Aggregate Measures. A sample box plot where you are disaggregating the data.